A handsome and classy Disney-sports drama, surprisingly intelligent and detailed about the sport. While mostly free of the schmaltzy sappiness of some of their other efforts of the past 10 years, like 'Remember the Titans', it's missing the dramatic tension and urgency of say, 'Seabiscuit'. 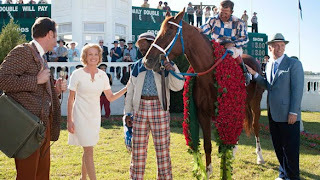 Penny Chenery (Diane Lane) is just a regular housewife in the 60’s, but part of a horse breeding family. After the death of her mother, and the dementia of her father Penny becomes inspired to grab hold the family legacy, save the ranch and her horses from being sold and rebuild a new breeding empire on the back of the legendary Secretariat. He’s probably the most famous horse in the history of horseracing - at least in the past 50 years. Famous for then being the first triple crown in 25 years and simply demolishing the competition by 31 lengths to win the crown in it's final Belmont Stakes in 1973. Weaved into this traditional sports genre is a astute business story, the economics of the breeding business and Penny's long game strategy to win. I like films where I can actually learn something I never knew before and coming out of Secretariat has given me a new appreciation for breeding and thoroughbred racing. Randall Wallace, primarily known as a screenwriter (Braveheart) but working with another scribe here, hits all the expected narrative beats. Like when Secretariat wins Horse of the Year, a jubilee moment for Penny, but by the rules of Syd Field, and others we know a dramatic ball will drop shortly. Indeed not one minute later does Penny find out her father has suffered a stroke. What doesn't work unfortunately is the b-plotting with Penny’s liberal daughters living it up as flower children in the 60’s. There's a strong performance from Diane Lane, despite her obvious wig. John Malkovich is fantastic as always as the stubborn but confident trainer Lucien. He supposed to be a French Canadian and thank God he plays his accent straight American. Fine character actors such as Dylan Baker round out the other characters adequately. Wallace must have had a difficult creative choice to make as to how to film the racing sequences. We can't help compare to Gary Ross's hyper-stylized treatment of the racing scenes in Seabiscuit. John Schartzman’s photography in Gary Ross’s film is still the last word in this regard, as Wallace’s races scenes are only serviceable, employing a handheld point of view style likely subject to the film’s significant budget differential to Ross’ bigger and grander film. Secretariat just doesn’t resonate thematically. The lack of a strong metaphor, whether it’s socio-political as in the relationship of Seabiscuit to the Great Depression, or the connection of the horse to the emotional arc of it’s main character. As such Secretariat, the film, loses out to Seabiscuit by a length or two, but it still makes for an entertaining race.